An all new family-friendly racing attraction, Aqua Drag Racer, was just opened this past weekend at Wet ‘N Wild Orlando. This awesome all new water based racing attracted is expected to be the tallest and fastest of its kind in Florida! With its four lane racing it will provide thrill seekers with an experience unlike any other around. Standing six stories tall and featuring four parallel racing lanes, guests will take their place at a starting line that is 65-feet high and prepare for a turbo-charged adrenaline rush the whole family can share.Get ready for a full throttle plunge at screaming speeds while powering through enclosed braided, twisting tunnels at fifteen feet per second. 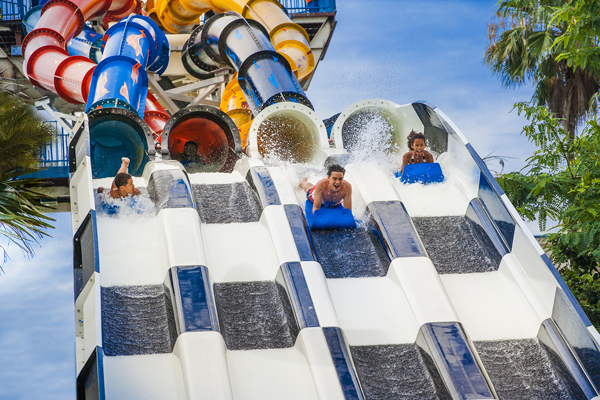 It is full throttle acceleration with no brakes allowed and the newest way families share the rush in a head-to-head racing competition at Wet ‘n Wild! It looks like a fun ride! My son would definitely love it! We’ll have to check it out on our next Orlando vacation which will hopefully be within the year! For more information about The Aqua Drag Racer™, visit www.wetnwildorlando.com. The Aqua Drag Racer™ is now open daily during regular waterpark operating hours. As much as I like waterparks that is too much for cowardly me! My daughter loves Wet N Wild. this looks fun for the boys! I love water parks, this looks awesome. Would love to do these slides, but I hate waiting 30 minutes or longer to ride a 15 second ride.